Abstract: Inland vessels are often used to transport containers between large sea ports and the hinterland. Each time a vessel arrives in such a port, it typically visits several terminals to load and unload containers. In the Port of Rotterdam, the largest port in Europe, there are 77,000 inland vessels that have moored in the port in 2014 for transporting cargo. With the significant growth of containerized cargo transportation over the last decade, large seaports are under pressure to ensure high handling efficiency. Due to this development and the limited capacity at terminals, the inland vessels usually spend longer time in the port that originally planned. This leads to low utilization of terminal resources and congestion in the port. This paper proposes a novel two-phase planning approach that could improve this, taking into account several practical constraints. Specifically, we take into account the restricted opening times of terminals, the priority of sea-going vessels, and the different terminal capacities and sizes. In addition, we also consider the option for inland vessels to carry out additional inter-terminal transport tasks. Our approach is based on the integration of mixed-integer programming (MIP) and constraint programming (CP) to generate rotation plans for inland vessels. In the first phase, a single vessel optimization problem is solved using MIP. In the second phase, a multiple vessel coordination problem is formulated using CP; three large neighbourhood search (LNS)-based heuristics are proposed to solve the problem. Simulation experiments show that the proposed LNS-based heuristic outperforms the performance obtained with a state-of-the-art commercial CP solvers both regarding the solution quality and the computation time. Moreover, the simulation results indicate significant improvements with shorter departure times, sojourn times and waiting times. Reference: S. Li, R.R. Negenborn, G. Lodewijks. 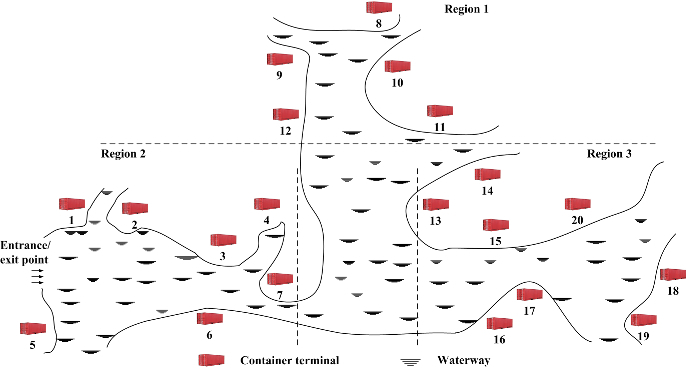 Planning inland vessel operations in large seaports using a two-phase approach. Computers and Industrial Engineering, vol. 106, pp. 41-57, April 2017.